Improvise and use leftover cooked salmon and cherry tomatoes fresh from the Farmer's Market (or your garden! 1. Drain salmon and remove skin and bones. Flake salmon and blend with mayonnaise, lemon juice, olives, celery. horseradish and salt. 2. Slice tops from cherry tomatoes with a very sharp serrated knife. Remove pulp and discard. 3. 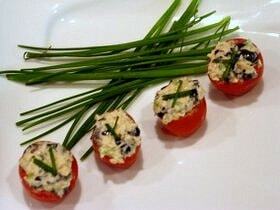 Stuff salmon mixture into tomatoes and sprinkle with chives. *It's easiest to get the pulp out of the cherry tomatoes with a small grapefruit spoon or melon scooper. *To prevent these prepared appetizers from rolling around on the platter, gently slice the bottom of the tomato to create a flat surface. *If you are preparing this recipe as GLUTEN FREE, just make sure that you are using a brand of mayonnaise that is GF.